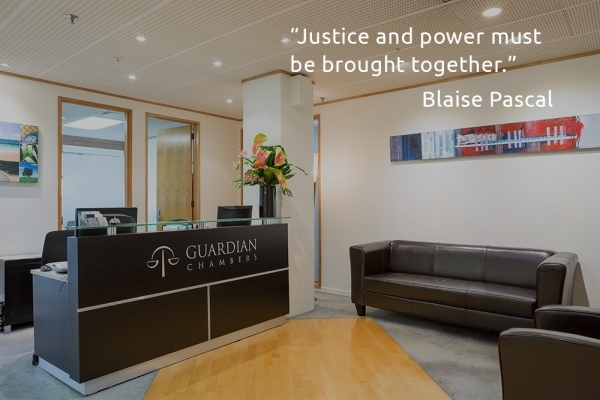 Work undertaken by members of Guardian Chambers is through private instruction or by appointment as legal aid counsel. In privately funded matters, a solicitor’s referral is required by law. If a client has not been to a solicitor’s firm first then Guardian Chambers can arrange for an introduction to a solicitor’s firm so a formal referral can be obtained. Barristers at Guardian Chambers will be happy to discuss fee arrangements with clients and provide estimates for the work that is required. Work may also be obtained as a result of a legal aid appointment if the client is unable to pay a barrister's private fee. Legal aid applications are made to the Legal Services Agency based at the various District Courts. Clients charged with serious matters (with a maximum penalty of at least 14 years' imprisonment) are entitled to request a lawyer of their choice and in most cases that lawyer will be assigned to their case. Our support staff will be happy to provide you with an appropriate legal aid form and, after you have completed it, will submit it to the Legal Services Agency for consideration on your behalf. To find out whether you qualify for legal aid, click here.